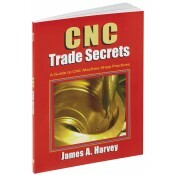 With this guide to proven CNC machine shop practices, you will be producing machine parts faster, with fewer errors, and with less labor. You’ll discover that you don’t have to know “everything there is to know” to make parts on CNC machines â”€ just as, for example, you don’t have to know everything about Microsoft Word to write a letter. Whether you are a shop owner, machinist, designer, or hobbyist, you will find yourself referring to this manual again and again.